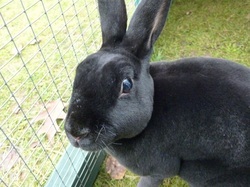 Ebony came to the rescue on 15th January 2011 and is a female rex. Her previous owners already have 2 neutered bonded bunnies, but were advised by a friend that they would be able to easily introduce a third bunny to the group. Unfortunately, in trying to introduce another bunny, even though she was an immature female, it upset the existing bonding of the other rabbits. Whilst it is possible to have groups of 3 or more rabbits, it is not always easy to carry out these bondings. Ebony is 6 months old and will be neutered sometime in January 2011. Once neutered, she will be ready to bond with a neutered male. Ebony is a very lively bunny rabbit who is always active. Ebony will give her new owner hours of fun just watching her explore her territory and scent marking everything she can!